Western Bottle News: Will the Real DR. MOTT Stand Up! This principally Western distributed Wild Cherry Tonic was named for Dr. Valentine Mott of New York City, a famous physician and surgeon that practiced medicine from the 1830's through the 1860's. Mott invented several "open secret" formula's and remedies that he left for anyone to use and sometime in the late 1870's A.H. Powers, a Sacramento California liquor merchant, introduced the Dr. Mott's Wild Cherry Tonic in an embossed sixth size square bottle . 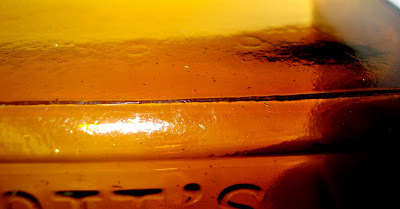 The bottle was embossed DR. MOTT'S WILD CHERRY TONIC A.H.POWERS & CO. Powers only pushed the Mott's tonic for possibly a couple of years and sold the rights to the product to the Spruance Stanley Company. Both the Power's and Spruance Stanley examples come with an applied top and the characteristic 2 rivet marks (or dots) on the lower portion of the panel to the right of the embossing. (pictured at left) The Louis Taussig product bottle also comes with the rivet marks in the same place on the same panel suggesting it quite possibly was blown in the same mold. The Powers and Spruance Stanley examples of the Wild Cherry Tonic are considered "rare" but the Spruance Stanley bottle seemed to be the more difficult of the two examples to put in my collection. If you are looking for a nice pairing of western square sixth's the Powers and Spruance are a fine addition to a western collection. Great post Rick ! The similarity of the Taussig bottle to the Mott's is much more apparent to me now after reading your post. Powers and Henderson first trademarked Dr. Mott's Wild Cherry Tonic in 1877. By the next year the firm was changed to A.H.Powers & Co, with Henderson remaining as a silent partner. 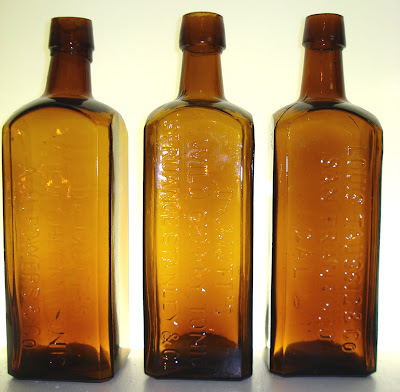 The trademark was changed to reflect the new name, at which time the familiar embossed bottle was ordered. Powers and Henderson first formed their partnership as wholesale liquor dealers in 1871. Late in 1879 Wilcox came on board and the firm's name became Wilcox, Powers & Co. By 1884 both Henderson and Wilcox were removed from the scene and the business again became A.H.Powers & Co, remaining such until 1887. For the background on the Wilcox, Powers and Henderson connection. Now, what do you have on Spruance Stanley taking over the Mott's brand from Powers? My only information comes from Wilson's 19th Century medicine in glass. It has been my experience that some of Wilson's information doesn't read true. That's great info on the Mott's ! So, I assume then the A.H Power's version dates 1878-79 only ?? It appears that you are right in assuming the Powers example of the Mott's dates 1878-79. The Spruance example, on the other hand, doesn't have any advertising that I can find so dating the years of distribution is difficult. Anyone have anything on when the Spruance Stanley Mott's was manufactured? That is affirmative, Rick and AP. As of November 1879 Wilcox was firmly aboard, but it is entirely possible that stock-on-hand Powers embossed Mott's could have been sold until the next year. I would hate to think that whatever number of bottles remained on hand were tossed out when the company became Wilcox & Powers. Too bad that the 1870s-80s dump is gone for the most part. I-5 construction removed it for eternity.